The high demand for mobile phone accessories, as well as high product profit factors prompted many mobile phone manufacturers to introduce mobile phone accessories. For example: Samsung has launched Alcantara covers that offer durability and a texture with a soft touch feeling. Alcantara is a material used in automotive, fashion and design industries for its elegance and comfort. 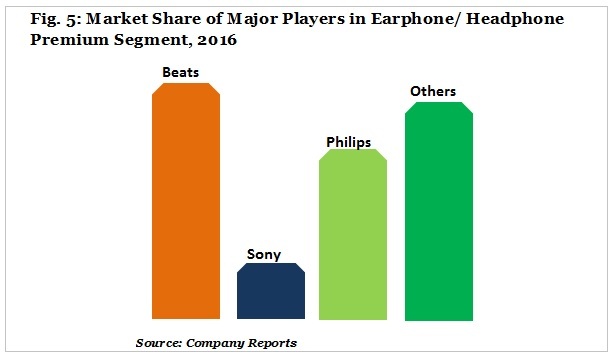 Wearing stylish earphones has become an emerging trend among the various mobile phone accessories players such as LG, Apple and Samsung. For example: Beats (Apple) introduced neckband earphones that work via Bluetooth and offer features such as noise cancellation and has the ability to play eight hours during a single charge. The various kinds of mobile phone accessories such as Bluetooth wireless headphones offer significant benefits over wired devices such as portability, convenience, cost-effectiveness, efficiency, and flexibility. Further, the increase in internet penetration has boosted the online retailing platform as it offers convenience to the customers while shopping online for the mobile accessories. Thus, the adoption of smartphones and suitable channels offered by the e-retailers is expected to drive the worldwide growth of the mobile phone accessories market over the forecast period. This increase in the adoption of smartphones due to the effective connectivity to the digital world is predicted to supplement the growth of the mobile phone accessories market across the globe with significant market valuation of USD 101,063.6 Million by the end of 2023 from USD 62,713.4 Million in 2016 by witnessing a compound annual growth rate of 7.3% during 2017-2023. The global mobile phone accessories market is segmented by regions into North America, Latin America, Europe, Asia-Pacific and Middle East and Africa, out of which, Asia Pacific dominated the global mobile phone accessories market by contributing a market share of 70.6% in terms of volume in 2016, followed by Europe with a market share of 19.3% in 2016. The large population base in Asia combined with the cost competitive smartphones has accelerated the growth of the mobile phone accessories market in the region. Further, China holds huge opportunity for mobile phone accessories due to its large existing and potential customer base, rapid smartphone adoptions, and growing online retail market coupled with increasing disposable incomes. In Europe region, the Germany mobile phone accessories market is expected to achieve absolute $ opportunity of USD 1,140.2 Million in 2023 over 2022. Further, the U.K. mobile phone accessories market is expected to remain dominant in the European region expanding at a CAGR of 8.7% in terms of value during 2017-2023. 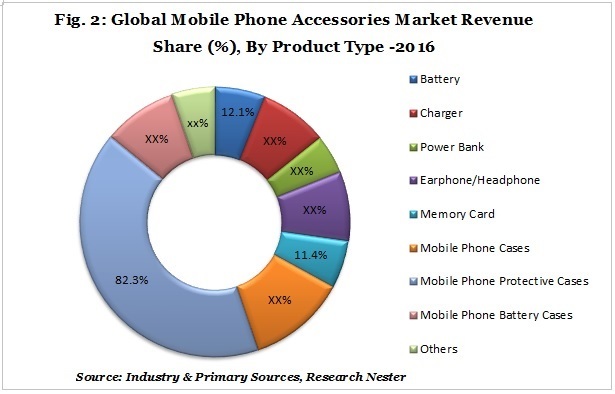 The global mobile phone accessories market has been segmented by product type into battery, charger, power bank, earphone/headphone, memory card, mobile phone cases, mobile protective cases and mobile battery cases. 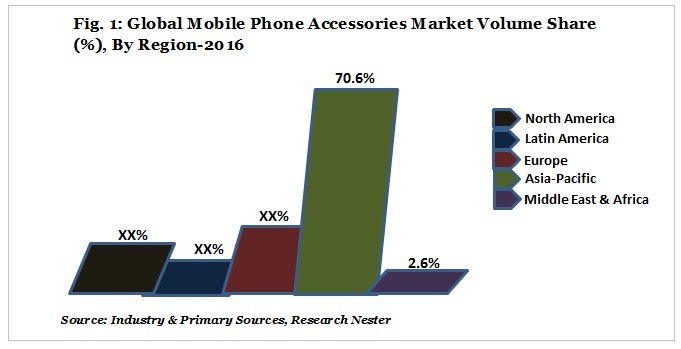 Among these segments, the mobile phone cases segment is likely to observe a growth rate of 1.7x in terms of value during 2016-2023, whereas the mobile phone protective cases remained the highest revenue contributor in terms of value, occupying 82.3% market share in 2016. However, the mobile phone battery cases segment is anticipated to expand at a highest CAGR of 9.8% in terms of value during 2017-2023. Further, the battery segment is expected to expand with a CAGR of 2.9% in terms of volume owing to the increase in sale of battery units due to the growing demand among the consumers as the games played on smartphones reduces the battery life of the phones. Along with that, the charger segment is expected to observe Y-o-Y growth of 4.3% in terms of volume in 2023 as compared to previous year. The global mobile phone accessories market is divided by distribution channel into single-brand store, multi-brand store and online-store. 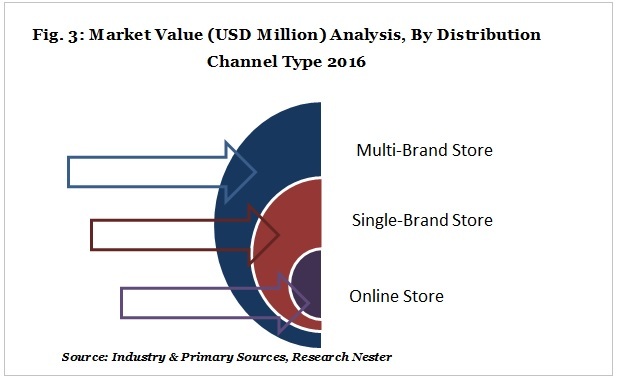 Among these segments, the multi-brand store segment dominated the overall mobile phone accessories market by holding a market share of USD 26,703.0 Million during 2016, followed by single-brand store and online store. Further, the multi-brand store is expected to behold its dominant stance over the forecast period owing to the wide range of mobile accessories offered by the multi-brand retail stores. Along with that, the single-brand store is expected to expand at a CAGR of 5.5 % during 2017-2023. The global mobile phone accessories market is segmented by price range into premium, mid and low, out of which, the mid price range segment dominated the global mobile phone accessories market by reaching USD 24,920.7 Million during 2016 and is expected to continue its dominance by expanding with the highest CAGR as compared to other segments during the forecast period. Moreover, the premium segment is expected to witness Y-o-Y growth of 3.9% in terms of volume in 2023 as compared to previous year whereas, the low price segment is predicted to witness a CAGR of 6.6% and is further believed to attain incremental $ opportunity of USD 1,834.2 Million in 2023 over 2022. The global mobile phone accessories market is thriving on the back of the rising urban population across the globe, characterized by urban upper class and high net worth individuals that has led to a strong demand for advanced mobile phone accessories such as premium headphones, power banks and premium battery cases among others. Moreover, rapid migration from rural to urban areas, particularly in countries such as China and Indonesia is expected to drive the growth of the market over the forecast period. Further, the technological advancements and the consumers’ preference towards online channels are also contributing towards the growth of the market. The growth of the market is hindered by the high demand for low-priced accessories and poor economic conditions combined with intense competition between the industry players of the mobile phone accessories market around the globe. Some of the affluent industry leaders in the global mobile phone accessories market are Samsung, LG, Apple Inc., Morphie, OtterBox, Incipio, Maxboost, Vena, Blackberry, Motorola, Belkin, Griffin, Beats, Sony, Phillips, Sennheiser, Panasonic and others. The companies are introducing new technologies and are working towards the expansion of product portfolio along with investing in high quality R&D to develop highly engineered and innovative products for best consumer experience in order to gain competitive edge in the mobile phone accessories market across the globe. 6.5.1.1. North America Mobile Phone Accessories Market Value (USD Million) & Volume (Million Units), By Country-2015-2023. 6.5.4.2. Middle East and Africa Market Mobile Accessories Value (USD Million) & Volume (Million Units) By Product Type, 2015-2023.